Breathe on me, Breath of God. Fill me with Life anew. Teach me to love as thou wouldst love and do as thou wouldst do. She awoke, as if from a dream (or maybe she still was dreaming) and as she looked around, she realized she was standing on a lawn; it was full of shoes… there were very many, indeed there were 7,000 pairs of shoes— red ones, yellow ones, black ones—each perfectly arranged with its mate, and each pair sitting at equal distance from every other pair… and each of them represented a child who’d been killed by gun violence since Sandy Hook. She gazed with deep grief at the silent memorial and wondered, can life come from death? It seemed only God knew. He had been walking for what seemed like days, his vision began to blur until he collapsed from dehydration and exhaustion. He was unconscious when the volunteer with No More Deaths/No Mas Muertes found him in the Mexico-US Borderlands and began to minister to him. He awoke as he was being carried through the desert valley. Beyond the face of the stranger who was bearing his body, he saw a white cross marking where one (who could have been him) had died. It was a very large valley and it was very dry and many, many had died there. Ze was awake but couldn’t bear to pull themselves out of bed. It had been like this for two days now. It felt like the “valley of the shadow of death” that their grandmother talked about often. The depression seemed to be worse amidst the winter and the news on the television. Their grandmother had been their rock and had helped them, but now she was gone. It was a huge valley and the shadows were very deep. They pulled the covers over their head and tried to block out the pain. Then, as now, we live amidst a reality of death and death-dealing; of cruelty and oppression; of grief and loss. Then, as now, the Spirit of God gathers us in Her arms and, still very much with us, takes us to those places of death that we might bear witness to the pain, that we might not turn away. But then, as now, the valley of dry bones, of death, of death-dealing may be real, but it isn’t the end of the story. “My Name is Emma González. I’m 18 years old, Cuban and bisexual. I’m so indecisive that I can’t pick a favorite color, and I’m allergic to 12 things. I draw, paint, crochet, sew, embroider—anything productive I can do with my hands while watching Netflix. “But none of this matters anymore. With words like these as rallying cries, tens of thousands of students around the country walked out of classrooms this past Wednesday, even as some faced threatened detention, suspension and, in at least one school’s case, paddling—in order to march—literally bone upon bone—to embody a message of NO! Not one more death. “Wade in the water… wade in the water, children, wade in the water… God’s gonna trouble the water…” As she sang this song—the words as old as the Exodus from slavery and the tune as powerful and strategic as the Underground Railroad—Yara Allen, the theomusicologist for the Poor People’s Campaign, walked with others into the Rio Grande just in front of a section of the Wall at the US-Mexico Border before she was arrested (still singing) in protest, in faithful proclamation—No Mas Muerte, no more death. When the doorbell rang, ze wasn’t quite sure what to do. Ignore it? Answer it? Somehow, they managed to get up to answer it. And when they did, what stood before them was a friend with two bags. One bag was filled with take-out of their favorite food and the other was filled with art supplies and a copy of A Brief History of Time. “We’re going to eat and talk and cry and create together,” she said as she walked in. What is this prophesying anyway? What does it mean to prophesy? It seems to me it means now, as it did then, that prophesying is about claiming a future truth. It means dreaming and declaring a future hope here and now. It means embodying a deep curiosity for what sacred mystery might heal. It seems to be that prophesying is as grand as Emma Gonzalez’s words before thousands; and as clear as Yara Allen’s singing and walking into waters-that-have-been-made violent borders; and as concrete as a friend who knows that sometimes only art and theoretical mathematics can begin to heal a broken heart. But it also seems to me that then, as now, prophesying isn’t a one time thing. Because even as powerful as the prophesying of Ezekiel and Emma and Yara and the friend who showed up… as powerful as each was (and is), it is neither enough nor the end of the story. Then She said to me, “Prophesy to the breath, prophesy, mortal, and say to the breath: Thus says our God: Come from the four winds, O breath, and breathe upon these slain, that they may live.” I prophesied as he commanded me, and the breath came into them, and they lived, and stood on their feet, a vast multitude. I don’t know about you, but I am really struggling right now. It seems that God has picked me up and put me down in a valley of dry bones… of tennis shoes of slain children… of immigrant death… of trauma and grief. As I sit with many of you and I read the news and I try to pray, I feel like our scripture for the day is prescient in its description of what we’re facing. And it’s also prescient in how it is that God acts and to what God calls us. Just like Ezekiel when God refused to let him turn away from the death that was in his land, God refuses to let the faithful pretend that suffering and oppression aren’t real. But even as God put Ezekiel in the midst of the valley, God never, ever leaves. God begins by literally holding Ezekiel in Her arms and then precedes to teach and nudge and empower, always at Ezekiel’s side, whispering in Ezekiel’s ear, breathing with Ezekiel and through Ezekiel. And one of the primary lessons is that to bring life back, God and Ezekiel have to be persistent: “Prophesy,” God says… not once, but three times. Death is stubborn. Oppression is slippery and adaptive. 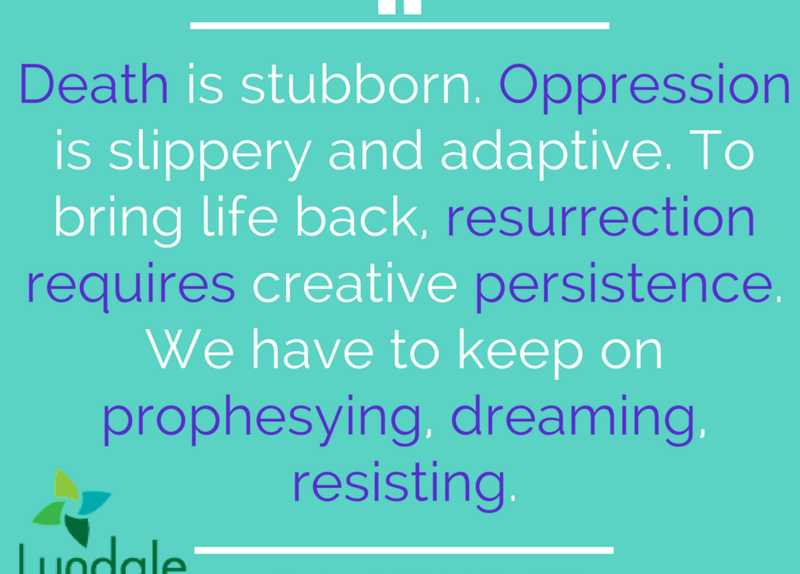 Therefore resurrection requires as creative a persistence and more. We can’t only preach to the bones… no, we must prophesy. We must claim a future hope, a curious heart, a partnership with mystery that allows us to call beyond death in order to claim resurrection. As you know, one of our modern prophesy-ers died this week. Stephen Hawking was one who seemed able to have been a kindred spirit with the stars and the planets and all the company of creation and he called us into a partnership with mystery that left us changed. Remember to look up at the stars and not down at your feet. Try to make sense of what you see, and wonder about what makes the universe exist. Be curious. And however difficult life may seem, there is always something you can do… It matters that you don’t just give up. Gazing up at the stars and around at one another; breathing in the very breath of God… may we be persistent prophesiers.